If you need forklift propane to keep your business running, one of your biggest concerns is making sure you never run out of the fuel. When you partner with Josef Gas as your supplier, one of the first things we will do is help you determine your monthly fuel needs. Then, we’ll set up a delivery schedule to ensure you always have full cylinders on hand, without having too many empties laying around taking up precious space. How do we do this? It’s not as straightforward as counting up your cylinders and dropping them off. For efficiency’s sake, we take into account both your weekly need and our weekly delivery routes – and we factor in a few extra cylinders just in case things get surprisingly busy for you. Figuring out your forklift propane needs is a simple calculation. We start with your annual usage and do the math from there. If you have an annual gallon count, we will take that number and divide it by 52 weeks to determine your weekly gallons need. Sounds simple enough, right? Not so fast. Forklift propane is available in different sized cylinders. To make sure you have enough to meet your needs, we need to do one more calculation: Divide the weekly need by the cylinder size. This will give us a number of cylinders that are needed each week. 12,000 gallons annually/52 weeks = 230 gallons. We will take that 230 gallons and divide it by 7.9 gallons (that’s how many gallons are in a standard 33 lb. cylinder. We’ll adjust that number if you choose to order a different volume cylinder). 230 gallons/7.9 gallons = 29 cylinders per week. Next, we determine how many deliveries you will receive per week. Let’s assume 2 deliveries per week. 29 cylinders/2 deliveries per week = 14.5 cylinders per delivery. We’ll round up to 15. 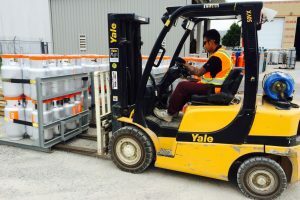 As far as calculating the number of spare cylinders to have on hand, we recommend one cylinder per operational forklift in your fleet per delivery. Add this number to the number obtained in Step #3 to determine your actual bi-weekly delivery number. If you have five forklifts, we will add that number to the 15 we obtained above to get 20 cylinders delivered each time. 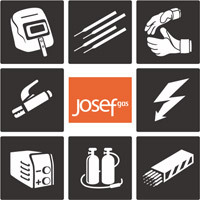 Josef Gas is an independent industrial gas supplier. We operate out of a 3-acre facility in Concord and have the largest single storage propane tank facility in the area. Our 15 delivery trucks are all owned by Josef Gas and run routes throughout Greater Toronto including Pickering, Markham, Mississauga and Brampton, as well as the Kitchener, Waterloo and Cambridge areas. That’s doesn’t mean we won’t make a special trip out to delivery you extra forklift propane if you need it. We understand that business can ramp up unexpectedly or you may have a busy season and a slow season. If this sounds familiar, just give us a call and we’ll adjust the delivery schedule as needed, so you always have exactly what you need on hand. To learn more about our forklift propane delivery services or to arrange a delivery, call us at 416.658.1212. We’ll walk you through the basics and get you set up on a delivery schedule right away.